Let’s face it: No matter how much you love your friends and family, you probably don’t love how much it costs to show them you care. The holidays are expensive, and finding the perfect gift at a reasonable price can be tricky. Which is why we’re taking the guesswork out for you with a list of gifts anyone would love to receive—all under $100. One of our favorite ceramic brands, SIN always kills it with giftable options. Give this pink vase alongside a bunch of your favorite flowers for an instant accent piece—or even last-minute centerpiece. Give the gift of relaxation. Herbivore Botanicals’ detoxifying soaking salts are made from Himalayan pink salt crystals and will make any bath feel like a spa. Elevate a foodie’s stash of kitchen tools with hammered copper and gold measuring cups. The antique look is so different from other utilitarian accessories on the market; your friend might even want to display these on their wall as decor. If you know someone who likes abstract art, get them this conceptual painting. The color combination is gorgeous, while the simple design makes it the perfect choice for almost any decor style. This platter is named after a Parisian neighborhood, which is only fitting, given that it looks like you picked it up at a French antique market. The slightly irregular shape makes for a visually interesting serving piece your giftee will get tons of use from. Historically, “stylish” isn’t the first thing that comes to mind when one thinks of playing cards. This matte black deck is here to change that. It’s an equally great stocking stuffer if you’re on the hunt for a smaller present. 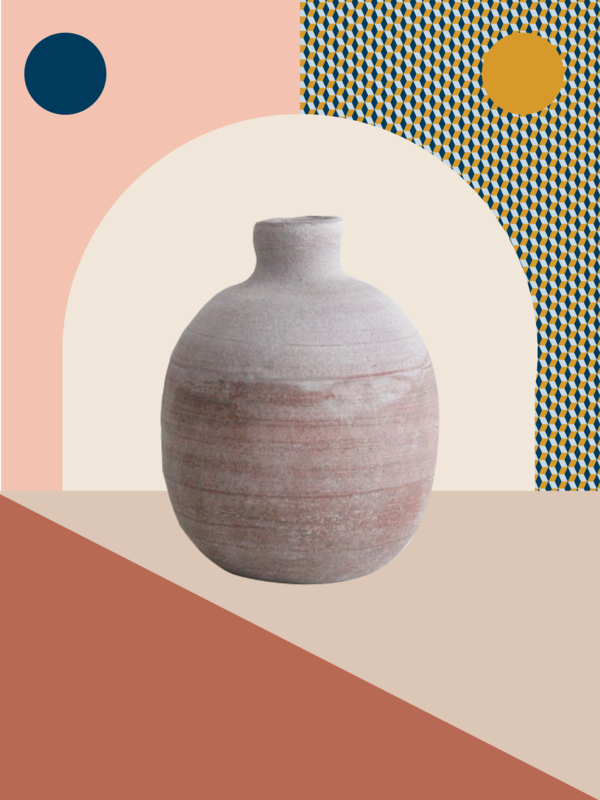 You can’t get more classic than a terracotta vase. If you have any rustic decor aficionados on your list who won’t stop raving about their summer trip to Greece, get them this pot. Coin purses are one of those accessories that most people won’t buy for themselves, so treat someone to this elegant leather pouch. The sapphire hue is especially striking. Any bar cart would be thrilled to have this shiny set on its display. The elegant pair is prime for the person on your list with a penchant for cocktail parties. What, your mirror doesn’t come in a rose quartz base? This luxe product will make a glam addition to your friend’s vanity or bathroom counter. Don’t forget the most important members of the family: pets. This is definitely the chicest leash we’ve ever seen—the recipient won’t have to worry about cluttering their entryway storage because they’ll want to hang it proudly on the wall. A candleholder that doubles as a vase is the perfect decorative trinket. Its cool sculptural shape and rosy color are just the cherries on top. This one’s for the person on your list who desperately needs to chill out. Give them a friendly hint via this uber stylish hand-blown glass pipe. Pale blue linen will transform any bedding or sofa into a calming place your gift recipient will want to relax in all day. Is your friends’ apartment a veritable fire hazard due to all the candles they keep? They need this set: It comes complete with everything needed to ensure the longevity of their favorite fragrant accessories. A simple yet timelessly elegant ring the minimalist in your life will want to wear every day. Ribbed glassware feels instantly elevated, and this set is no exception. They’re especially ideal for cocktail mixing; so if you want to build out this gift, package the set alongside all the fixings for your giftee’s favorite beverage.